Windows and exterior doors are a very important part of your home. Windows that old or low quality can significantly impede your home's performance. All windows are a weak point in your homes energy efficiency. A wall generally has a R-factor of 13 to 21. A old window in that wall has an R-1.5. You can see just how much heat loss/gain that just a few windows can effect. There are other measures of performance like u-values and DP rating. The overall idea is the same...old windows are inefficient! Window manufactures have been working to make vast improvements to capture the demand for efficient and low maintenance product. We work with you to find the window line that best fits your homes style and performance needs. We use window manufacturers like Pella that we know will stand behind their product. Pella has a number of different window lines for each budget and continues to offer industry leading performance and value. We will explain these options to you to ensure you understand the costs and benefits of all the alternatives. There are many window companies out there, many of which we wouldn't put in our homes if they were free. We have seen too many failures where a window looks perfectly fine on the outside and inside but has been leaking into the wall cavity for years. Many times the wall will look fine on the outside and inside, but when we start to tear off siding, we encounter rot and mold. 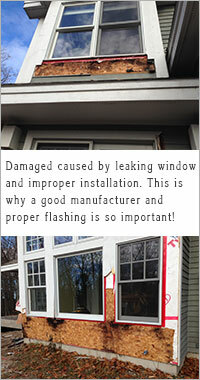 Too often we encounter leaking, rot, and mold because windows were not properly installed. We drive by jobsites even today and see companies installing new windows incorrectly. All the employees at North Sky Exteriors are thoroughly trained in the proper procedure and method as dictated by each manufacturer, as dictated by building code, and based on our company standard. Our experience in this industry has allowed us to see so many different types of successes or failures that we know what to look for and how to prevent issues. We not only serve Traverse City with quality window installation services, we our professional installers also provides service in Lake Leelanau, Elk Rapids, Old Mission Peninsula, Antrim, Torch Lake, Williamsburg, Northport, Interlochen, Leland, and Glen Arbor.